Began his educational career at 13 as a pupil teacher at Sunning Hill Board School, Bolton. He went on to Liverpool University becoming a First Class Queen's Scholar. in 1903 he was appointed first assistant master at Albert Street School, then in 1909 he became Headmaster of Hob Lane School, Edgworth. In 1923 he returned to Horwich as Headmaster of Lee Lane Council School and in 1931 he was appointed head of Horwich Senior Boys School where he remained until his retirement in 1944. Represented North Ward from February 1945. Honorary Treasurer of Bolton and District Teachers Association. Chairman of Lancashire Schools Athletics Association. He was a keen footballer and helped to form Nomads Football Club and also played for Smithills FC. 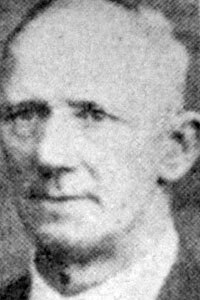 Later he became a Referee officiating in the Central, Lancashire Combination and Lancashire Amateur Leagues. He founded Whitehead's XI as a team for Horwich and Westhoughton boys who had left school. He died in office and his duties for the remainder of the term were undertaken by the previous Chairman, Wilfred Tomkinson.